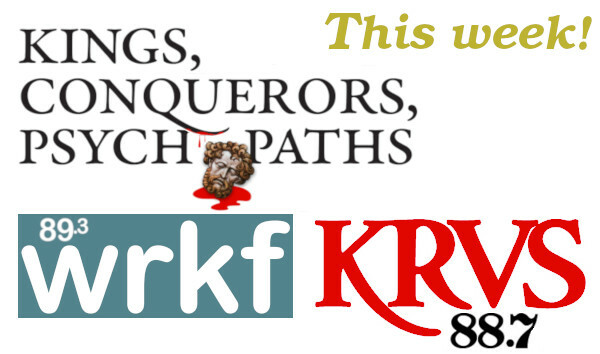 Hear author Joseph N. Abraham, MD on ‘Talk Louisiana’ and ‘Bayou to Beltway,’ in podcasts on the NPR affiliates WRKF & KRVS, discussing politics and his book, Kings, Conquerors, Psychopaths. Join me as I talk politics and discuss my book on governmental and corporate narcissism on two of the best talk show hosts in the South Talk Louisiana & Bayou to Beltway, on NPR affiliates WRKF and KRVS, respectively. On Monday, February 4th at 9:00AM, I will be a return guest on Talk Louisiana with Jim Engster on WRKF in Baton Rouge. The broadcast can be heard on-line. If you miss the show, you can listen to the Talk Louisiana programs on their podcasts. On Wednesday, February 6th at 12:30PM and Saturday, February 9 at 5:30 PM, I will be the guest of my friend, and the UL Associate Dean of Liberal Arts Pearson Cross on his show, From Bayou to Beltway. The interview can be heard on KRVS in Lafayette, 88.7FM. Bayou to Beltway can also be heard on-line, and the podcast will be available afterward. To see a list of my previous appearances, and to listen to or watch previous interviews and talks, click here. Please click below to share on social media.